More about Fazermint Chocolate Creams Bulk Box - 6-1/2 lb You can finally stock up on your favorites for the year, whether it be for indulging at home, office, or distributing in your place of business. 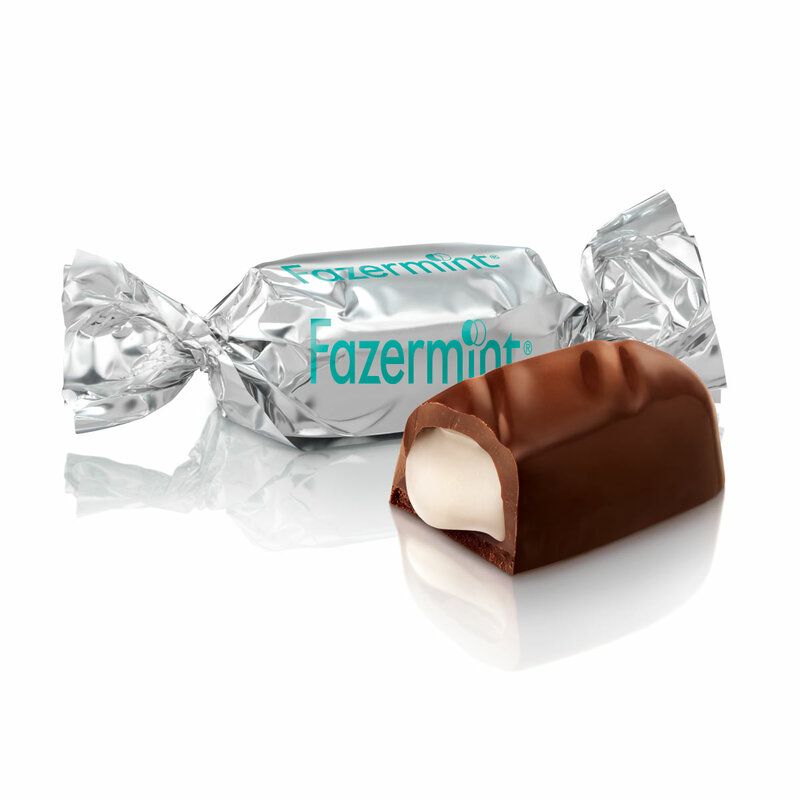 Refreshing peppermint filling covered in decadent dark Fazer chocolate is the perfect after-dinner refreshment. Fazer chocolate is made from fresh milk and high quality cocoa beans and is paired with cream made out of real peppermint for a rich, authetic taste. 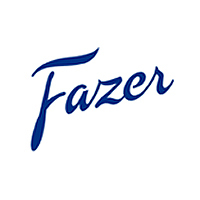 Originally created in 1961, this candy remains today Fazer's best-known premium product. 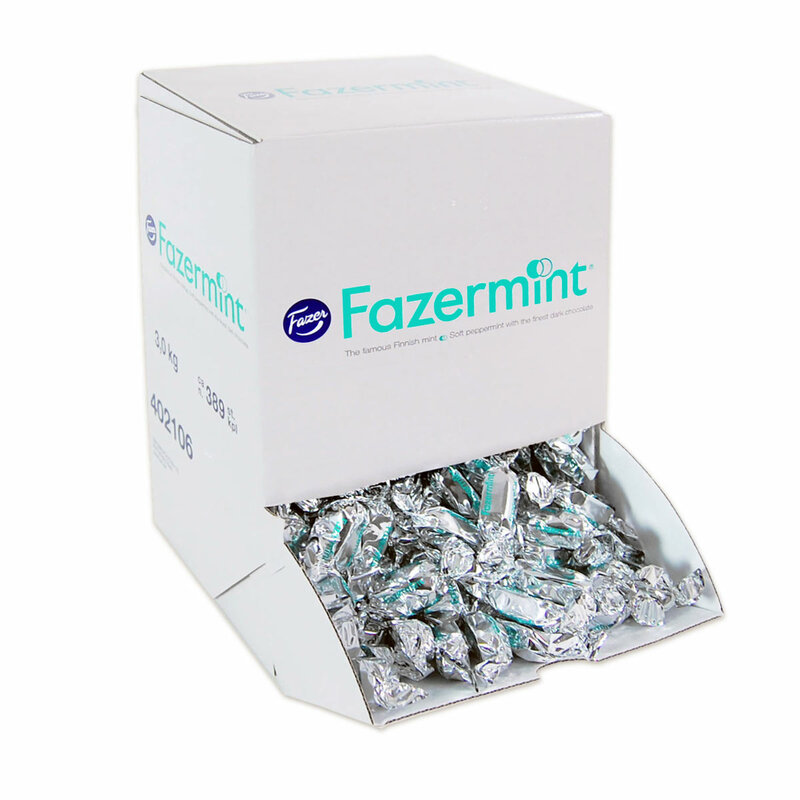 You recognize the Fazermint design by its silver packaging with the green logo and instantly know it's quality. 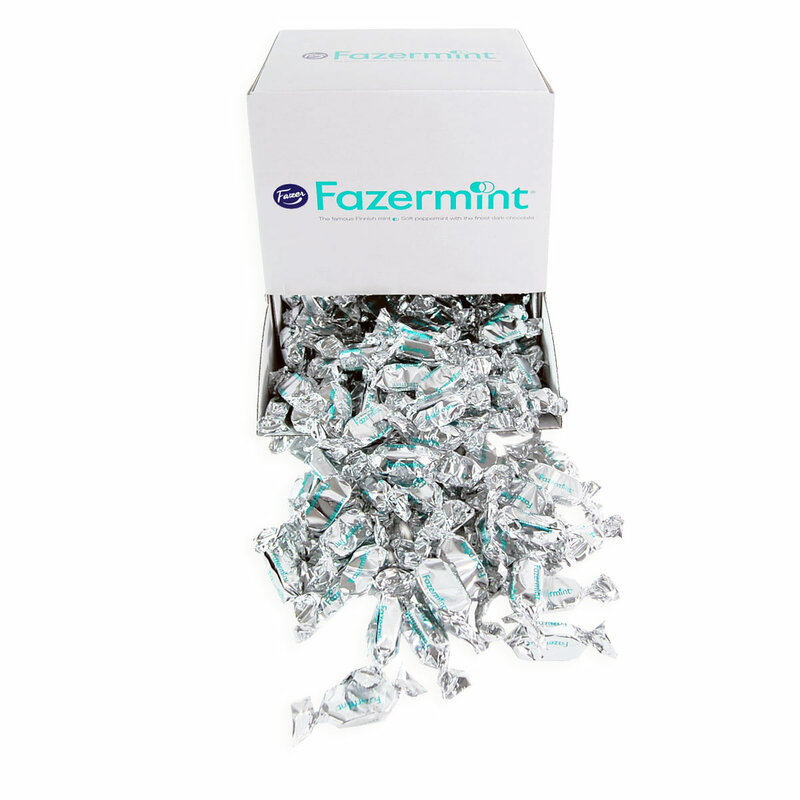 Price is for 3.0 kg (6.6 lb) box of Fazermint candy. There are approximately 390 candies per box. and store them in the freezer so I always have a supply. The mint is perfect, the chocolate is perfect, and the combination is wonderful. Love this huge box of mints - lasts me throughout the holiday season and beyond. Especially good if you keep them in the fridge. Dark chocolate becomes crisp and the cool lioquid minty center is yummy and refreshing. - It is my all time favorite chocolate mint! I originally bought a large box of the mints to have at home and bag some to give to friends and family for Christmas. They are the perfect combination of soft, sweet mint encased in dark chocolate. Having one is very satisfying for the sweet tooth. I think this will be in my candy dish from now on. I purchased a second box I bought for the Finland 100 Gala in Minneaapolis. We had a large glass bowl filled with them on the dessert buffet table for the guests. They were a huge hit at the Gala. These are by far the best mints around. I order them every Christmas and this year Finnstyle was the only company that could get them to me in time!! Thank you so much!!! Looooooovvveee these mints!! The candy I grew up with - so good! This large package rivals the price I was getting the mints at, but they have discontinued selling these. Happy to find a great deal on them here! ProsThe price of this box is very good! Great for Finland 100 celebration. One for everyone. Always fresh and delicious. Prompt delivery, great customer service! Good service, good fresh candy, good price and free shipping. What's not to like? I keep mine in the fridge and eat morning and evening with my coffee. Yum. These are my absolute favorite candy! I have purchased several times from Finnstyle, and will definitely be back for more! Finn has the best price and I get the candy quick and fresh! Great service! My order was received promptly, even earlier than I expected. The chocolate was fresh and perfect despite being delivered to our warm Florida climate. 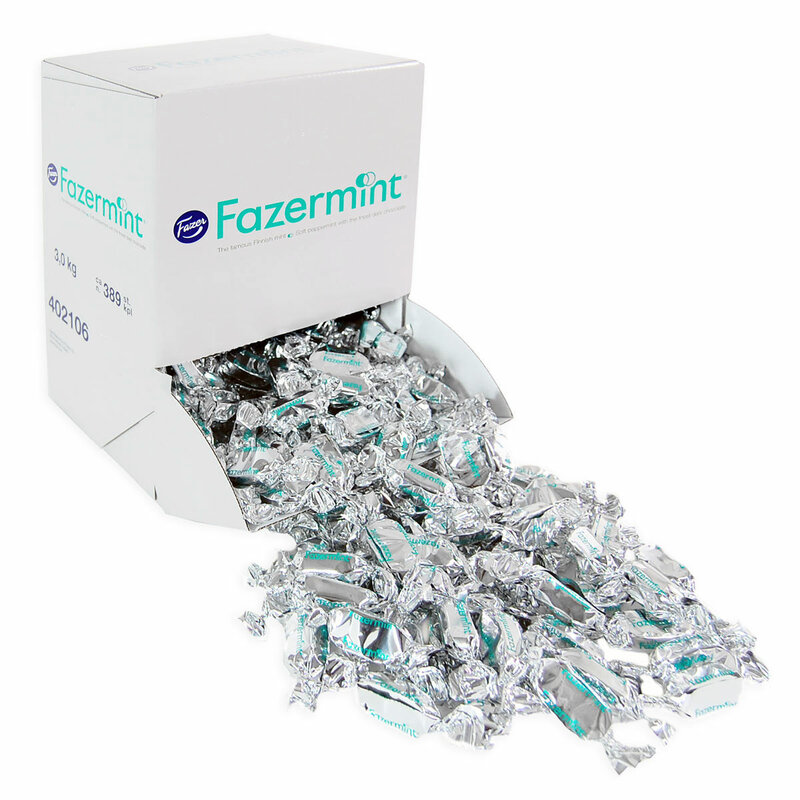 Fazermints are a combination of rich, dark chocolate and creamy mint. I'm not wild about chocolate the way many people are, but this chocolate's richness and intensity of flavor are delicious to me. The creamy and intense mint filling is the perfect complement to the chocolate. I'm hooked! I've been buying Fazermints for years, initially for myself. Lately, I have been sending 6-pound boxes to friends and acquaintances as gifts. They are no longer available locally, but FinnStyle's packing and shipping is exemplary. The packages always arrive here in a week when ordered on the net. ProsEverybody loves Fazermints. They make great Christmas gifts -- especially for businesses who can share them with customers. 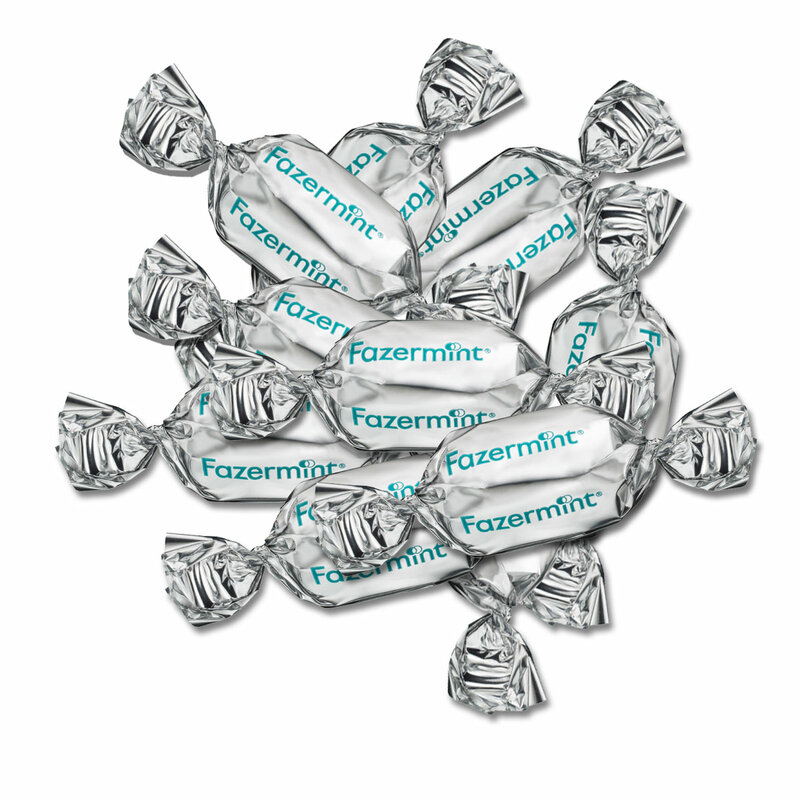 Fazermints are my very most favorite candy. I share them with all my friends and would recommend them to everyone. PUT them ALL in a bowl and mix them up!! Perfect when friends and family visit. I prefer mine chilled in the refrigerator OR mix them in my ice cream....yum yum !! !